This is a TRUE story I wrote for Maryland Voices. It doesn’t much focus on Tally Hall, but I can write up another entry (or if Coz will let me, edit this one) to focus more on the actual show, if you want. I was, as you may expect, not in the best of moods. My father, who’s in the USAF, was moving to Taiwan in three days; and, of course, bringing the rest of the family with him. Having lived in both Hong Kong and Beijing before, I was no stranger to Asia or to moving, but after three years in Columbia, I wasn’t too keen on the idea of leaving my school, my friends, and my girlfriend of over a year, nor was I keen on leaving Wilde Lake and changing high schools halfway through the year. The one good thing on the horizon was the fact that, today, Tally Hall would be playing at my house! A few weeks previously, I had been on the band’s website, and seen that they would be coming to DC on the 22nd, 3 days before I was going to leave. Tally Hall, an indie band out of Ann Arbor, Michigan, is quite possibly my favorite band of all time and I was very excited… until about the point I realized it was at a bar and therefore an 18-and-over only show. In despair, I asked my dad if the band could play an acoustic show in our basement, because the band’s policy was to play a free acoustic show near any 18+ or 21+ gig if the demand was great enough. Not believing the band would actually do it, my dad agreed, saying he’d even pay them a couple hundred, and feed them. I fired off an email to Rob Cantor, one of their guitarists, and their temporary booking agent. When the big day rolled around, my family had already moved into a hotel for the final few days, and our house was totally empty. I got up bright and early, and as soon as my dad was awake enough to drive, he took me and our friend who came all the way from Tuscaloosa, Alabama, to see the show, back to the house. Soon enough a few people started arriving, even though the show was six hours away. Some friends and I had decided to make a banner to give the band, to replace the one they lost a couple years ago. As soon as the sewing machine — I mean, my friend Carla — arrived, we started working on it. As Tally Hall’s arrival time drew nearer and nearer, more people started showing up, and so we had more people to help us work on the banner. Just as we were putting the finishing touches on the banner, the doorbell rings. As I rush to answer it, I catch a glimpse of a large van in the driveway. They’re here! Tally Hall, at my house, in the flesh! I invite them in, and they have a few slices of pizza before unloading the van. Since the band was doing an acoustic gig, they brought in an acoustic guitar, an electric bass (I guess uprights are too big to lug around), a set of bongos, a melodica, a vibraslap, a cowbell, and a glockenspiel, and we all helped them set up for the show of our lives. 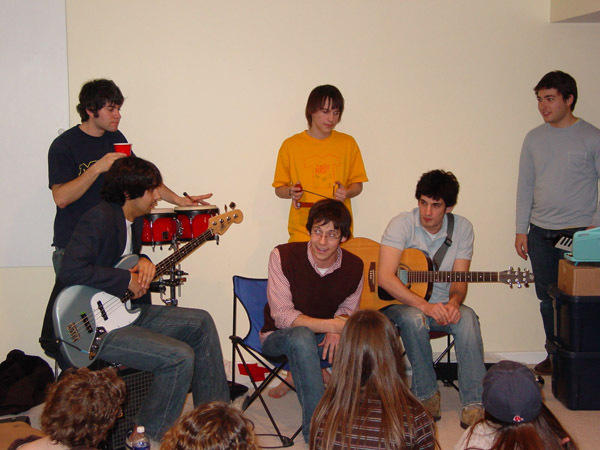 Minutes later, they launched into their 12-song acoustic set, which included the first-ever acoustic rendition of “Welcome to Tally Hall”. When the band first slapped the vibraslap, my sister and her friends cried out “HENRY!” bringing the show to a pause. Somehow the vibraslap ended up being named Henry, and the band incorporated Henry into every song, rousing cry after cry of “HENRY! HENRY!” As they started into their last song, the band invited me up onto their “stage” to play Henry. Feeling like I would wake up any moment, I walked to the front of the room and took my place behind the band. But all too soon, the show was over, and the band unloaded their makeshift merchandise booth (really just a pile on the floor) and started selling and signing CDs and T-shirts. And finally, the band had to go, to a fond farewell from all present. As the guests slowly left, I was saddened by the realization that I wouldn’t see them again for months, but I knew that my last days would be among my most memorable. BONUS! — Click here to watch the live performance video of Wall Party ’06!